The sudden end of what was otherwise a long process to fill a vacant Rockville City Council seat raises several questions, legal and otherwise. At a special meeting Wednesday night, the three finalists were again interviewed by the Mayor and Council. After the third interview was finished, the Mayor and Council abruptly went into closed session. When the public was let back into the room, Mayor Bridget Donnell Newton announced there was no consensus among herself and the councilmembers sufficient to give any of the three candidates a majority. Councilmember Beryl Feinberg then made a motion to end the Council vacancy process, and leave the seat vacant for the remainder of this term, which ends in November. The motion was seconded by Councilmember Mark Pierzchala, and passed unanimously. "The onus is now on this body to come together and serve this city as one for the remainder of the term," Newton said after the process fell apart. How the process ended was only the latest indication that appointments are not the way to fill Council seats. But it also left several questions about the legality of how it ended. There is a process on the books for filling this seat, as bad as it was. But it was not clear that the process could legally end with the seat remaining vacant. Secondly, the public was not only reduced to spectator status in this process, but was not given public indication that a vote would take place Wednesday night. As the photo of the meeting agenda clearly shows, a vote was not shown on the agenda. Nor was a closed session indicated on the agenda. That does raise some question about the legality of the meeting under the Maryland Open Meetings Act, which states, "'Before meeting in an open session, the public body must make available to the public an agenda' that (1) contains 'known items of business or topics to be discussed at the portion of the meeting that is open' and (2) indicates 'whether the public body expects to close any portion of the meeting' under GP § 3-305." Third, the vote to select a new councilmember should have been held in an open session. And finally, one or more participants in the closed session leaked the proceedings of the session - including the number of votes each candidate received - following the meeting. Such leaks are illegal, and an elected official could be disciplined for leaking details of an executive session. Ultimately, the outcome may be to the benefit of residents, as there is no majority to ram through any decisions on the future of RedGate golf course, or on adequate public facilities ordinance changes. Given past votes, it's unlikely the Mayor and Council would deadlock on the passage of the new budget, although other critical issues could wind up in a 2-2 tie. And with no members representing a specific district, the empty seat won't leave one area without representation. If anyone was treated more unfairly in this process than residents, it was the applicants themselves. They clearly spent a great deal of time preparing written statements and for interviews - some for two or three interviews. To dedicate so many hours for a job that in the end does not even exist was a waste of everyone's time and energy. With voting by mail now the norm in Rockville, there's no reason this process can't be switched to a special election in the future. #ScoopageTime: 21 hours, 25 minutes. No big deal about the timing. Stop nit-picking. Different sort of analysis on this channel. I don't agree with it necessarily, however. For example, I don't support special elections, especially when we are 8 months away from a general election. The cost of a special election is too great. Ideally, we'd have a functional city council that could find one applicant out of 20+ who could attract three votes. 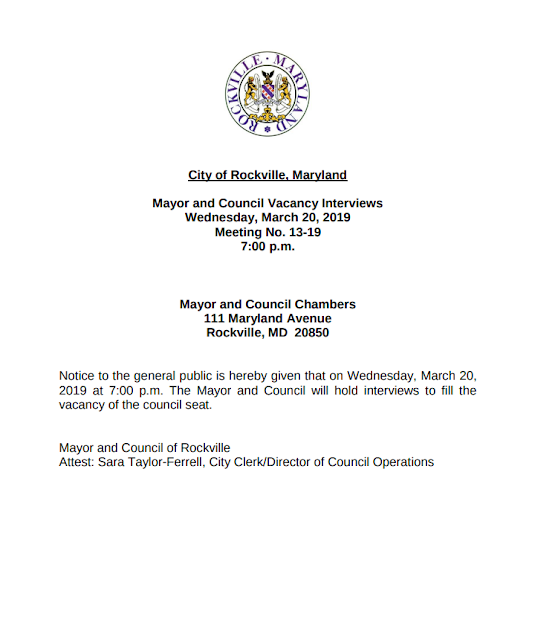 The incumbents did a disservice to Rockville residents by not selecting someone.